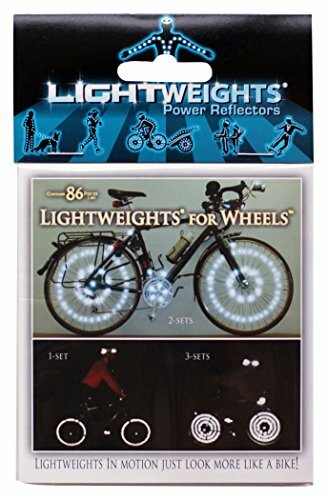 86 piece SuperBright Silver Reflective kit for wheels of all kinds even on bladed spokes. SuperBright Silver matches silver spoke color and 36 pieces weigh less than 2 grams per wheel installed, are perfectly balanced perfect for race training with no increased wind resistence or eggbeater-effect, visible from all directions 360°, cannot fall off or be stolen - all unlike standard reflectors. Precut, pre-measured pieces: 75 spoke reflectors and 5 circles for hub ends and then a teaser of 2 ovals and 4 circles of Lightweights for Clothing & Gear / Bright Kids / Halloweeny BeSeeny to place on your bike or helmet (or clothing and gear) included in the pack with easy to follow guide and spoke gauge template! These Original award-winning Lightweights are made from 3M Scotchlite reflective material and are the highest quality retro-reflective money can buy! When light hits this silver material it reflects a brilliant powerful bright light! 36 pieces weigh less than 2 grams per wheel installed, are perfectly balanced perfect for race training, visible from all directions, cannot fall off - all unlike other reflectors. If you have any questions about this product by Lightweights, contact us by completing and submitting the form below. If you are looking for a specif part number, please include it with your message.